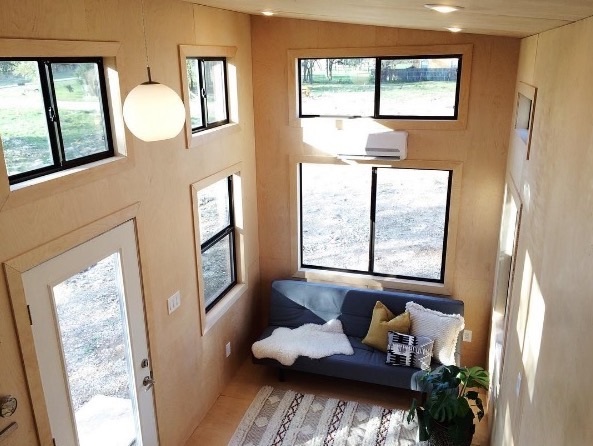 This is the Black Pearl tiny house on wheels by Nomad Tiny Homes in Austin, Texas. It features 200 sq. ft. in the lower level and an additional 60 sq. ft. loft that fits a queen bed. The home is 23.5′ long and is built with beautiful birch plywood throughout the inside. Available now for $39,000. Please enjoy, learn more, and re-share below. Thank you! LOVE it! For 23.5′ it has many of the items lacking in other houses – teriffic hanging space under the stairs, and more storage for clothing in other cubbies. Nice headspace in the loft…great to see a good sized fridge. I am thinking I might only need to add a countertop Breville or Cuisinart convection oven to be perfect. I love the birch plywood treatment – it gives a bright and contemporary feeling……sort of a Scandanavian vibe. The pricetag is quite reasonable if it is for this house, as shown. Nice job!! Awesome job. Looks good, great price! Nice built house for the price. Can’t tell what the wood siding and trim are made of on picture. Standard wood siding don’t last unless it is made of composite siding. i love the whole layout, the only thing i wish i would see more of is the bathroom. Now tall is the tallest place in the loft? Thank you. Beautiful interior…! And a snappy name… But how you going to get this into a neighborhood of folks who lived in some houses for years to accept this in their neighborhood… We need to be able to be accepted into communities not stand out, and become a pariah…! If you’re trying to keep this thing of ours alive, you must be socially acceptable, not an outcast for them to look to get rid of… I read everyday how people are saying they have no place to put these houses… Well how do expect to put them anywhere when no one wants something so different then theirs living next door to them…? These homes all though smaller must be able to fold into the mainstream of life, in order to be socially acceptable.. They need to look like they fit in, but smaller then others…. However sad this may sound, we all know this to be true, social acceptance is the key to mainstream life among others who are more fortunate than us….! No one wants to live next to the city dump right…? Houses in those neighborhoods are referred to as ghettos correct…? We do not want to be called ghetto dwellers, we only want to live a simpler life without the higher costs of living is all.. I hate to have to say this, it actually behoves me too, but I have looked at this problem of ours from all sides, and what we may sometimes call repurposed they call trash…! I don’t know how to make this sound any better than this, but this is what it all boils down to… Life is not always a bed of roses, and unless you have a piece of land in which does not interfere with mainstream life, where you can put your treasured home, you need to fit the part… Sad, very, very, sad…. But unfortunately true…….. Agreed! Hopefully with more and more embracing this concept and with more voices being heard as the demand for reasonable housing increases…hopefully some barriers will come down…would be nice if zoning legislators take notice too! Love the simplicity of this house! Smartest way to live, in my opinion! Adding my voice–please check out my indiegogo campaign by searching: Affordable. Housing. Now. I live in a community that is comprised of regular sized homes and they all have that New England look. My home is contemporary looking. Being of a different style is fine. It is the size and the wheels that don’t conform to most zoning laws for now, but awareness is growing thanks to folks like yourself. Haha, really? You get a tiny house to get away from society and then you need to blend in so another society accepts you? Way to go. I like the look of the outside of this house. Nothing to be ashamed of – if black offends then paint it. There are 3 houses in my parents development that are dark & monochromatic. It’s a design thing. Acceptance will be more based on you as a neighbor, is your house and area clean? Are you kind and curtious? Or are you a nutter that raves about acceptance. ? Finally. Great design at a reasonable price. Would like to see the bathroom accommodations. Very nice build; love the birch. As for places to put our THOWs, we need to develop a new mentality of people coming together, pooling their resources and purchasing enough land on which to put a small community (say four to six THOW’s). I recently saw a very nice piece of land for sale in Portland, OR. The asking price was $34,000. If six people chipped in, that would be $6,000, per person for the land. As long as everyone agrees to be sane and reasonable in their behavior and be good tiny housers, Tiny House Communities could fit in very nicely. And if one or more person(s) have a THOW that doesn’t match the surrounding architecture, careful fencing and/or plantings could solve that problem. Agreed Lisa E., very true. Peaceable neighbours break down barriers! Alot of good can be accomplished when communities work together! Yes, it’s possible to find decent land. We found a small irregular lot in NYC for, wait for it… $23,000! It was residential too…..of course, it just sold…found out yesterday…am devastated because we had hoped to put our tiny home there…anyway, adding my voice–If you care to back me and others trying to create secure housing, please check out my indiegogo campaign by searching: Affordable. Housing. Now. Did the land allow tiny homes? I know there are a lot of zoning issues etc that owners face. I thought a small, former campground close to a city would be an ideal THOW community. good luck finding that, I’d imagine! Some people are just lame! And truly need a life! Their comfort zone = misery! Great Tiny Home! Like it alot! Wow! So glad the inside was not dark like the outside, but had a lot of windows to bring in the light it needed. Well done! LIght colored birch plywood is ok on the interior. Nicely done. If there is a thow community then these can be bought and sold just like any house. Since you never know who your neighbor could be I prefer some distance from mine. On the other hand–you can move. What is the interior finished with? It looks like plywood, which leads me to have serious concerns about the healthfulness of remaining indoors for any appreciable length of time. Yes, I have a phobia of environmental chemicals/toxins, but I think it is good to have a healthy understanding of the materials we’re exposed to in daily life. Wish there were a 30′ version of this home, perhaps with materials that are a touch closer to one of the more expensive tiny home producers. Beautiful ! One possible drawback: wouldn’t it be more comfortable for stairs to access the higher side of sleeping loft ? I would not change floor plan, just swap the roof pitch to other side. There is a children’s book called Everybody Goes. It is about how everybody goes to the bathroom. Please remind the writers and photographers of this. Why should we need to say “Where’s the johnny?” That is an important part of tiny homes! Let us see pictures! If you take the time to click on their link (www.nomadtinyhomes.com), you can find more info on the Pearl and other products… it looks like it sold for $45k with custom finishes for buyer. Still a nice layout with room to grow/ customize to your tastes. Does anyone know how much it costs to put blinds or curtains on so many windows? Approximate cost? I love this home. I have been looking at these things for a couple of years now. My favorite innovation was the couple in Alaska, I think, that made a THOW with a “loft bed” that lowered…so no actual loft. It had tracks in the wall that kept it in place and was lowered/raised by something like a garage door opener. it was amazing. Add that above the living area in this THOW and you’d have a true winner. I really like this one! Yes that was Ana White’s design. Amazing! Beautiful. Would you sell the plans? Alex with Nomad Tiny Homes is building this one for me right now. Framing is up and I am so excited. Walls are shiplap and cabinets are shaker style. Stair storage will have doors. The outside color will be the same but the trim around the door and windows will be cedar. This is by far the most open and roomie tiny home I had seen. So I decided on it. I can’t wait until it is finished. Can tiny houses be put in trailer parks lot spaces? And how much and who do you pay to move them, how much per mile etc. Steal of a price!? I could buy a real house for forty grand, it wouldn’t be paid off but it would be a big portion of it. If I’m going to live in something so small I wouldn’t pay more than $10,000.00. Gosh I would love to know where you could buy a real house on real property for forty grand! Here in CA, its unlikely anything is available (even extreme fixers that are not habitable) under a quarter million. I love how light and airy it is. Feels so much more spacious. It really does! It’s awesome. I like it so much, very bright! I would definitely live there. I live in a small house, though not comparable to this one. but i try to maje it beautiful, I like to live in small space, it doen’t make me feel alone. I love looking for new items for my little home and a few days ago surfing on the internet I found this really nice project. Appears very light and airy. Love all the windows it has. Nice lay out as well.. But again I didn’t see any closet to hang clothes in. . I noticed a space across from the kitchen area next to the refrigerator. , But I’m assuming that to be used for food storage as well as other kitchen items like cook ware , dishes.and other misc, items , rather than hanging clothes..